This is a sponsored conversation written by me on behalf of Banana Boat® and OFF!®. The opinions and texts are all mine. School is officially out for summer vacation! Do you have summer travel plans? A week at the cabin? Maybe a road trip to visit family? With a couple of months off school, your kids will be looking for some fun activity ideas to celebrate summer. Here are a few creative ideas for outdoor summer adventures that can be modified for all ages! Learn A New Sport: With so many sports out there, I’m sure there are a few that your kids haven’t tried yet. Spend some time together researching a new sport (how to play, rules, etc.) and learn it together. At the end of the summer, you could even host a little family competition! 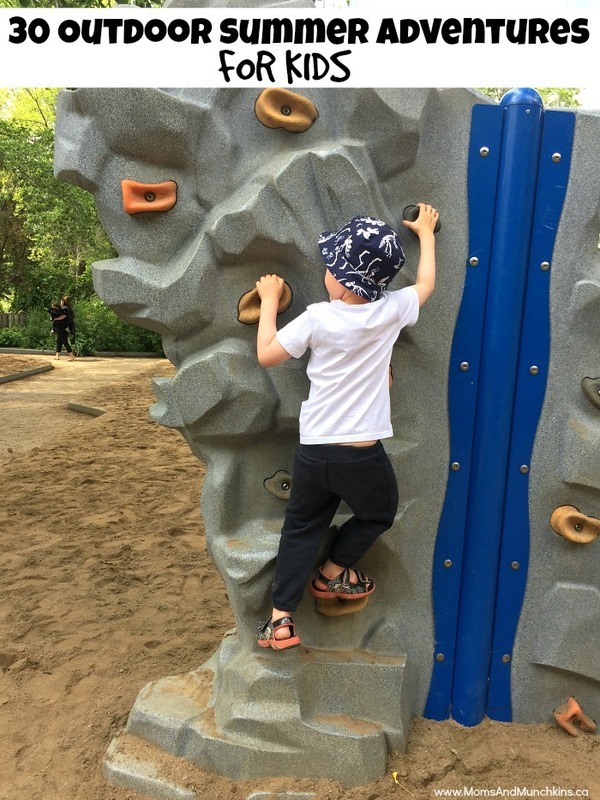 Rock Climbing: See if one of your local parks has a kid-friendly rock climbing wall that your kids could try out. Host a Family Scavenger Hunt: Make a list of things to find around the city then split into two teams – each team with a parent on it – and drive around the city finding the items and completing challenges. Visit New Parks: With a little Google searching, try to find new playgrounds and parks in your city that you haven’t tried yet then visit them as a family. Plan a Picnic: You could make an entire day of this by starting with grocery shopping, letting your kids help prepare the food then going on a picnic together. Visit an Outdoor Pool: The outdoor pools are only open for a short time each season so make a note to visit some this summer! Visit Landmarks In Your City: Does your city have special landmarks like statues or other outdoor art that you could visit? Go Canoeing: Rent a canoe and go on a family adventure. Create a Backyard Water Park: With some water balloons, sprinklers and squirt toys, you could make your own water park at home! Take Family Photos: Ask a friend to help take photos of your family at the park. Go Camping: Even if you can’t visit a campground this year, you could make a camping adventure in your own backyard. Take a Road Trip: Is there a city or town close by that you’d like to visit? Maybe a festival in another town? Plan a road trip to a place you’ve never been before. Order Lunch From a Food Truck: Does your downtown area have food trucks? Visit one with your family and try something new for lunch! Go Horseback Riding: Check your local listings to see if there’s a place near you that offers horse or pony rides. Attend a Festival: Is there an annual festival in your city that you haven’t tried yet? Even if you think it may not be for you, try it out with your family and you may be pleasantly surprised! Visit Your Farmer’s Market: Visit your local farmer’s market and see what delicious food you could buy. Sign Up For A Walkathon: Check your local listings for a charity walkathon and sign up as a family. Go to a Parade: Bring your lawn chairs and grab the best seats for your local parade! Go to a Sports Game: Is there a major sports team in your city? Grab some tickets and go watch the game in person! Attend a Day Camp: Most cities have organized day camps throughout the summer. Some are just for kids while others invite parents to join in on the fun too. Some ideas could be an outdoor soccer camp, art in the park, or even outdoor swimming lessons. Visit a Farm: Is there a farm in your area that lets you pick your own fruit or vegetables? This would be a great learning experience for your kids! Go on a Geocaching Adventure: It’s like a high-tech scavenger hunt! Go to the Zoo: If your city doesn’t have a zoo, you could go to a local park to visit ducks or check for a local farm that allows visitors to see the animals. Create a Backyard Obstacle Course: Using some of your toys like hula hoops, skateboards, and sporting equipment, make a obstacle course in your backyard and plan a family challenge. Go Biking: Pack water & snacks and go on a biking adventure on the local paths. Do you know where all the paths end? You may find some fun new parks! Watch the Fireworks: Check your local listings for a fireworks show then pack blankets and snacks in the back of your vehicle for when you go out to watch them together. Go to the Beach: Spend a day at the beach with your family playing in the water, building sandcastles and making memories. Fly Kites: Wait for a windy day then head to the park to fly kites together. Plant a Garden: Teach your kids about growing their own food or how to take care of plants by planting a garden together. Build a Soap Box Derby Car: You’ll need some help from the builder in the family for this activity! When spending all that time outside, remember to protect yourself from the sun with sunscreen. Don’t forget about the insect repellent if you’ll be in an area with mosquitoes. 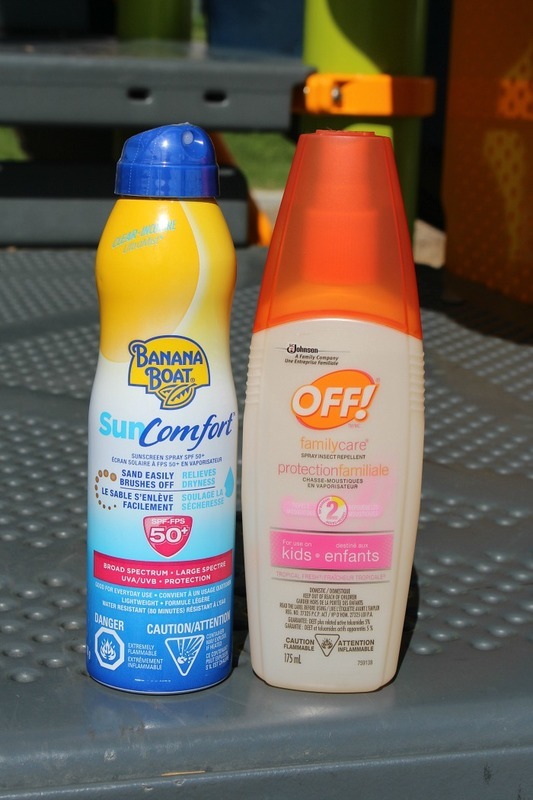 I was recently asked by Banana Boat® and OFF!® to share some ideas for family fun and how these products can help you enjoy your time outdoors. I purchased these products together at Walmart and my son and I have now started our summer adventures! My son and I go out for a long walk every day while stopping at the parks in our neighborhood. I always make sure we’ve applied our sunscreen first. 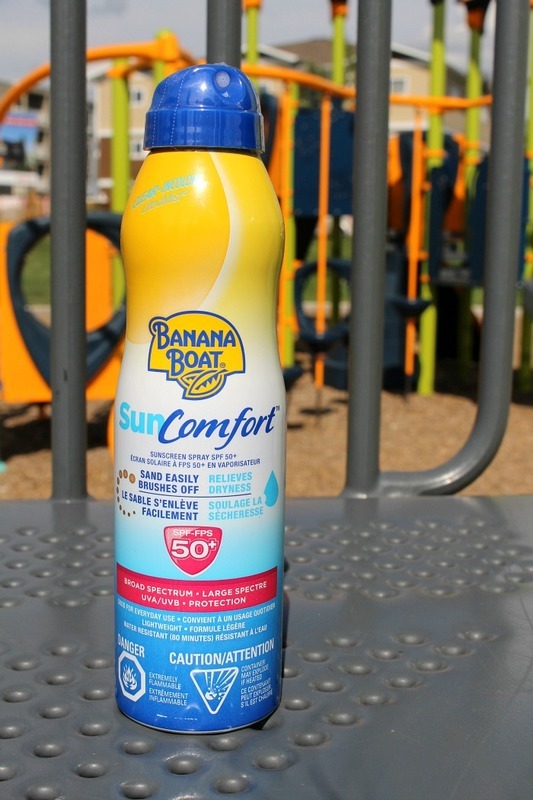 Banana Boat® sunscreen is an excellent choice for many reasons – the product moisturizes to relieve dryness & it provides safe & effective broad spectrum UVA and UVB protection. While out playing sports in the field, we make sure we’ve applied OFF!® to protect from mosquitoes. My son had a soccer game a few weeks ago and I couldn’t believe how many mosquitoes were out in the field! 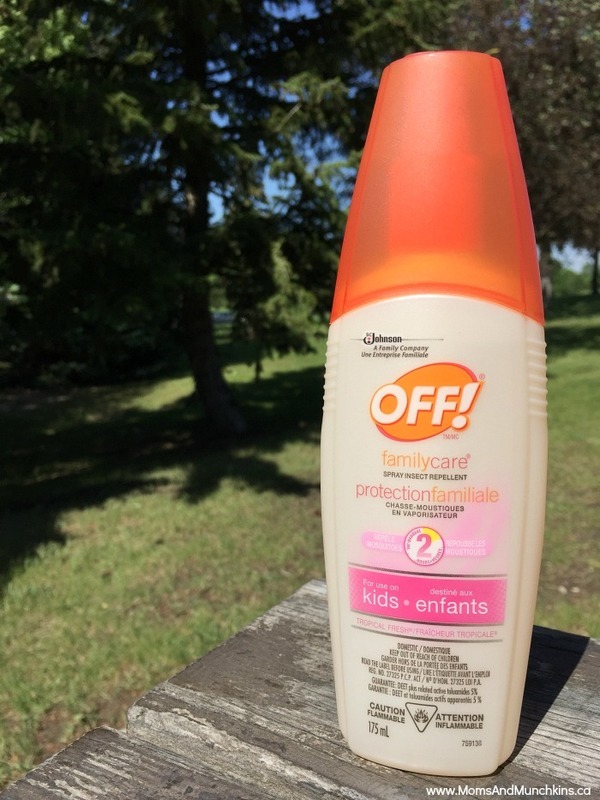 The OFF!® familycare spray insect repellent repels mosquitoes for two hours so make sure you pack some spray in your bag if you’ll be outside longer than that but read the instructions on the back of the bottle to make sure you’re applying it correctly. What fun outdoor summer adventures will you be enjoying this summer?